The Ropeless Consortium meeting was held on November 6, 2018 at the New Bedford Whaling Museum, New Bedford MA. Learn More. 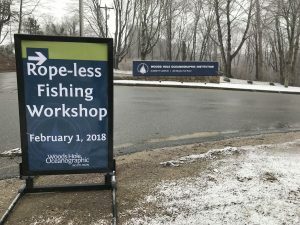 The Woods Hole Oceanographic Institution and the Anderson Cabot Center for Ocean Life at the New England Aquarium hosted a one-day workshop on Thursday, February 1, 2018 entitled “Overcoming Development, Regulatory and Funding Challenges for Rope-less Fishing in the U.S. and Canada.” The workshop was motivated by the most recent assessment of North Atlantic right whales, which indicated that the species is in its 7th consecutive year of decline with only about 450 whales left. Fishing gear entanglements cause the majority of right whale deaths, and also contribute to declining calving rates through the prolonged health effects of non-lethal entanglements. The development and eventual operational use of rope-less fishing has the exciting promise to eliminate all trap/pot gear entanglements, the cause of most right whale entanglement deaths. The objectives of the workshop were to (1) discuss the need for and approaches to implementing rope-less fishing to reduce entanglements of large whales in trap/pot fisheries, (2) discuss and develop regulatory pathways to make rope-less fishing legal in the United States and Canada, and (3) discuss strategies to fund two phases of development: demonstration/evaluation and experimental fisheries. The workshop format consisted of presentations followed by facilitated discussion on the urgent need for rope-less fishing techniques, the current state of development of rope-less fishing, technical development plans, regulatory challenges and solutions, and the funding landscape.